It was beginning of the third day of my unplanned trip and I could not see and end to the game of Jenga untill someone placed a block in an unbalanced position using his poor architectural skills and the building collapsed without an Earthquake. 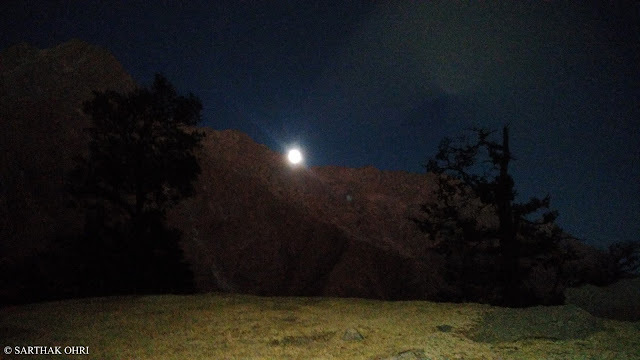 To get over the loss of such beautiful building we decided to play a game of Bluff using 3 decks and eventually wall clock of Zostel Dharamkot striked 1.30 AM to remind me that I was left with only 5 hours to snore before I could begin my trek to Snowline Cafe, probably. (I was still travelling unplanned). 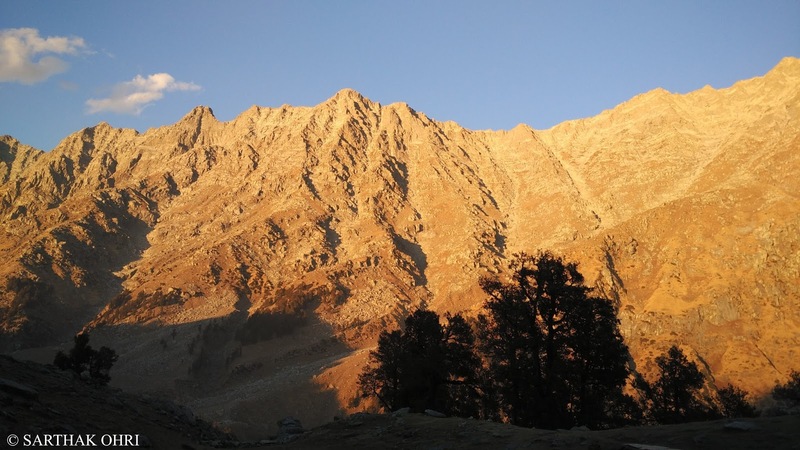 It was Eight in the morning and I realised that I should stop snoring and start trekking to snowline cafe, 'Probably'. 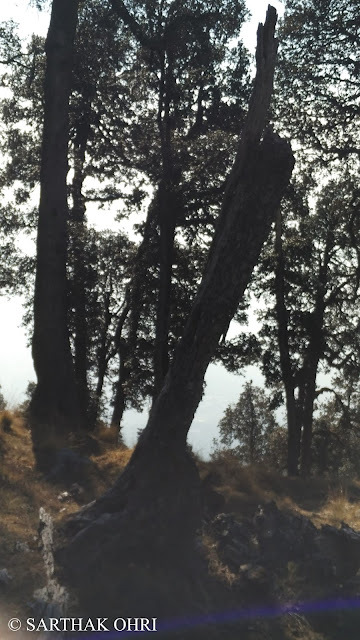 The morning sun rays at the veranda of Zostel Dharamkot were kind enough to relax my confused mind and aching feet but unkind enough like hot tea to not allow me to stand up and check out. Finally after half and hour of fight with my relaxed feet I ran out of the hostel and began hiking towards Galu temple (The base camp). Tinku, The owner of Rest-a-while cafe at Galu temple is patient enough to lend his ears to my adventurous desires ever since I met him for the first time and this time he personally arranged a guide for me who would take me to Snowline cafe from a 'Road less Travelled'. The idea of this route had been breeding in my heart since long but suddenly struck me in the last moment.. The route to snowline cafe was a ridge that connects Galu temple with Triund. The original route goes through the slope at the right of this hill. 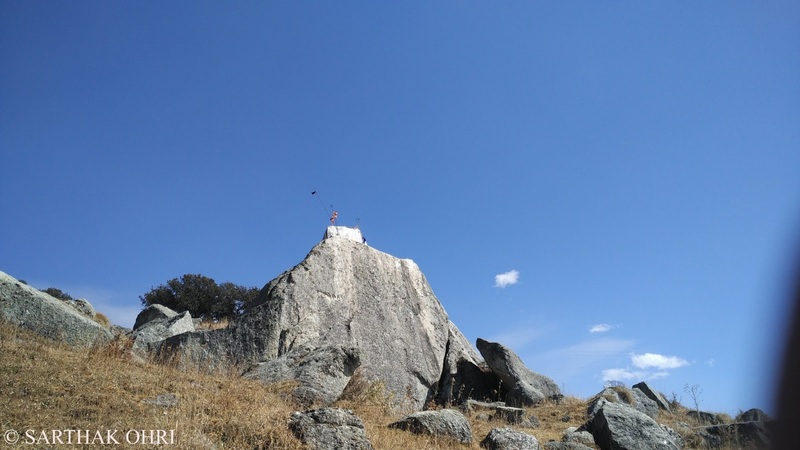 On this route one comes across three major landmarks which are three temples with each of them painted in white colour and perched on a rock. 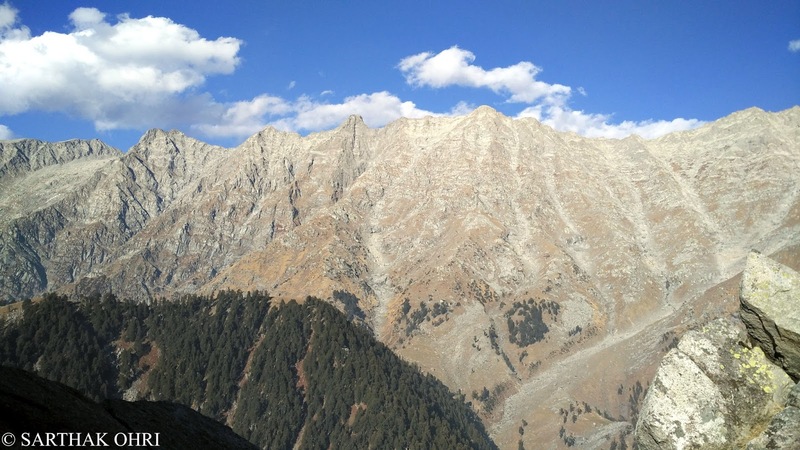 Route in Orange is the original route to Triund and beyond. While the route in Green is what we took. This time I reached the first temple dedicated to Goddess Durga well before my scheduled time. 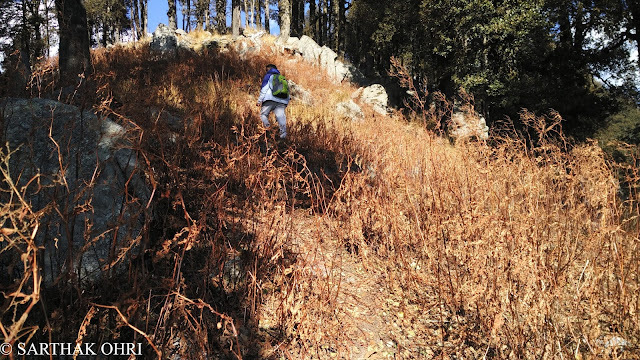 The route is quite steep but the trail is clearly visible in this season as the trail was not covered with leafs which usually happens in monsoon. This temple was rated as the best viewpoint by Inditramp and it certainly is (click here for GPS logs). 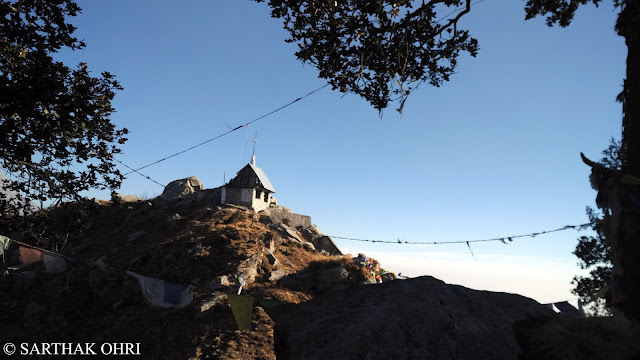 This route is all about being close to nature and experiencing the solitude which can be experienced only when one is far away from the regular Triund trail. Up to the first temple the trail is quite steep and it usually takes around 1.5 hours to ascend this forgotten route. One can clearly hear the sound of even smallest of the insects and that is what we call 'Natural'. 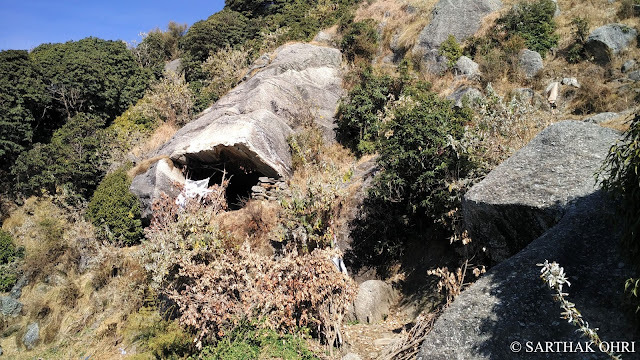 Just before the temple are a few natural caves which served as a temporary home for previous generations of local residents when they came here to graze their cattle. 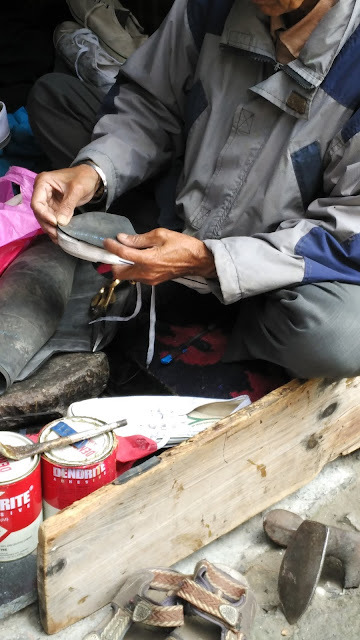 One member of the family used to descend to Dharamkot everyday to supply milk and another one was responsible to protect the cattle from wildlife. Such was a hard way of earning money which is far away from the minds of today's generation. Route to the next temple is quite treacherous one and often regarded as the most difficult patch of this trek which allows you to gain altitude while you pass through dense forest with narrow winding trails. What I could guess about this patch after gathering information from a lot of locals and my guide of course was that this patch of about one hour of trekking is prone to wildlife. While all the jungle book characters were crossing my mind I realised that there was a werewolf walking beside me. Yes you read it right, My guide was a werewolf whose 'Sense of smell' was so powerful that he could smell humans who had left this spot a couple of minutes/an hour ago. He sniffed so well that he could guess the brand of 'biri' (cigarette) those guys had smoked. While all this was happening I was struggling hard to blow my nose and let into some fresh air. My guide started to whistle that was loud enough to get a reply back (not an echo though, but a real one) from three foreigners who were hundreds of meters ahead of us. Finally after a lot of hitchhiking we reached the second temple which looked similar to the first one with similar beautiful camping site comprised of a vast area and we met three 'Bullet Train Hikers'. 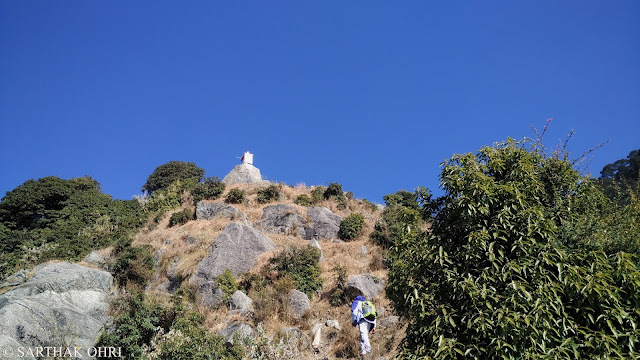 The girl was guiding two foreigner guys through this route and our concerns about three foreigners hiking unguided on this route finally vanished when my guide saw the girl who was leading. She had been on this route multiple times and was now guiding other foreigners to this route (perhaps for few dollars. That's what my guide told me). I call them bullet train hikers because they trekked at a pace so fast that for a while I thought they may cross the pass and have evening tea at Chamba. But in the end the fuel of Bullet train exhausted at 'Ilaqa'. Again the desires of a short nap tried to peep in but this time without looking into the eyes of my guide I was wise enough to understand and move on. 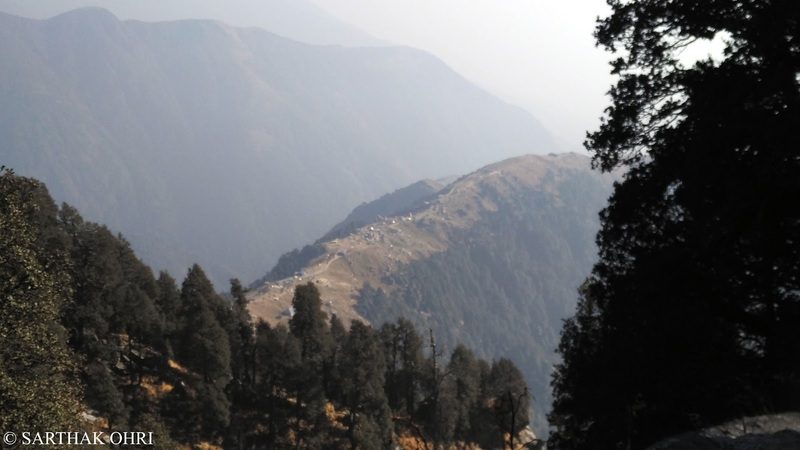 Kangra valley was looking beautiful from this place and so the whole Dhauladhar range. Cirrus clouds were adding charm to the landscape while I noticed a flock of birds passing by. Sometimes I really feel that I should have a DSLR but that is pretty much fine as I can wait for someone to gift it to me. Dhauladhar Matterhorn to the right. Benefits of hiking on a ridge are that you can see the both sides. The route is simple. 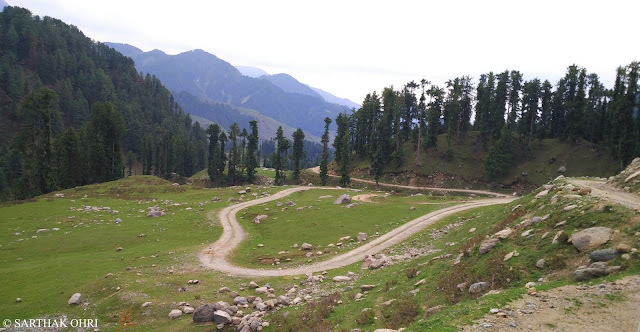 Keep climbing the ridge which comprises of few short hills and this will definitely give you a roller coster feel. Same was happening with me. Every time we climbed higher a surprise in the form of a new hill awaited which was higher than the one I was standing on. After another half and hour of hiking through not so dense forest we reached another plateau where we had our packed lunch. From here I was given another surprise in the form of three more hills to summit before I could finally reach the last temple (Kunal Pathri Temple). Not wanting to climb anymore I wished I could set up a camp on this plateau but could I do that? Of course not! 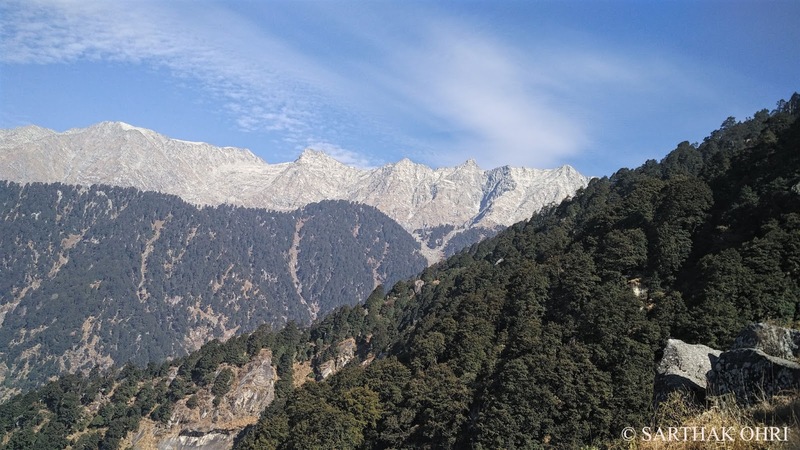 By now Triund ridge was visible at a distance and the distracting sounds of weekend tourists could be heard very clearly. It was 1.30 PM and I roughly allocated one hour for each hill. The forest now became more dense than what we saw an hour back. 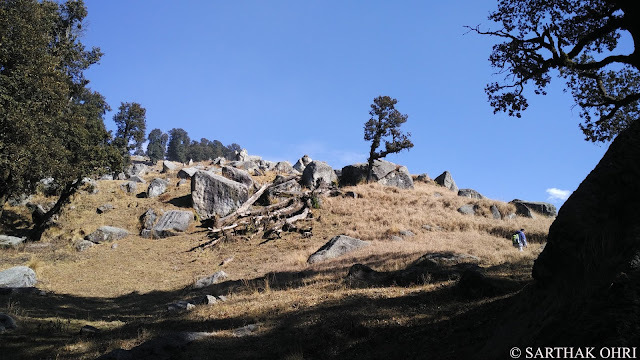 The path was not as tiring as what we trekked on an hour back as we had almost reached the top of the ridge and most of the climbing job was over by now except an 8 feet high boulder somewhere on the way from first hill to second which remided me of my mountaineering course. Half alive or half dead? 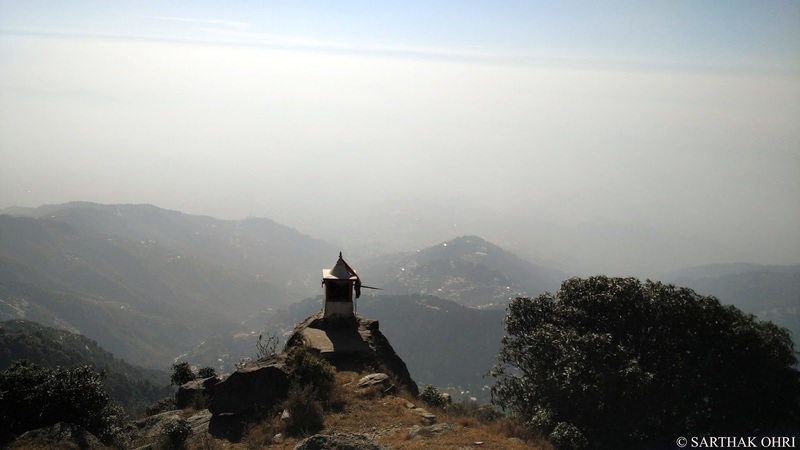 It was 2.30 PM and we had summitted both the hills and were climbing the third one. By now my shoes were dying to dry themselves but I had to get out of the forest to get good amount of sunlight and some much required rest. Weather was favouring us but not the loud chatterboxes at triund. I could get a glimpse of temple but it was a long way to reach there. It was about 100 meters before our last religious checkpoint that we decided to spend few moments there. From this point one could get a complete view of Dharamshala's share of Dhauladhar mountains and I could not afford to miss such an opportunity to gaze over few climbing/hiking routes through my binoculars. 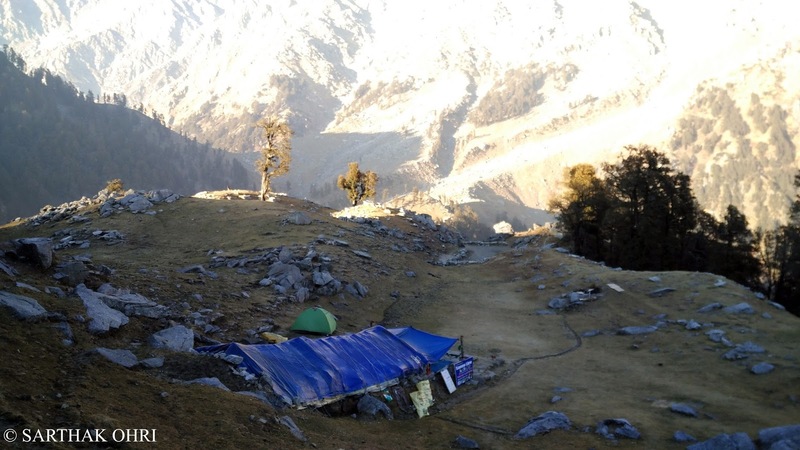 Snowline cafe would not give us a complete picture, especially for rhe route from Ilaqa to Indrahar pass. Soon we left the place taking a note of how empty alcohol bottles were burried in this part of God's mountains. 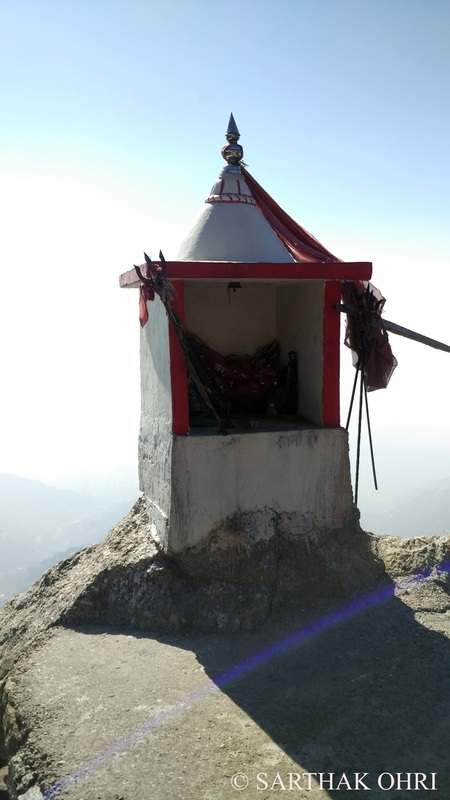 Upon reaching the temple at 3.05 pm my guide completely surrendered himself to the beautiful views, blessings of temple deity and charging sunrays. He completely forgot who I am and I was loving this sight as this temple holds much religious significance for locals. Finally me and my shoes dired themselves and I could have a short nap without worrying about the serious gesture of my giudes eyes. 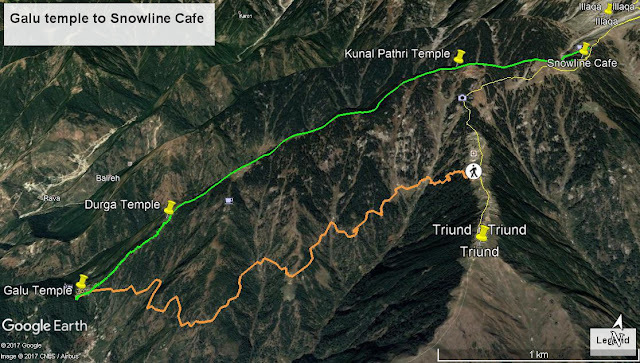 Finally after half an hour of sunbath we left for snowline cafe which was just 10 minutes short walk from the temple. 1.5 to 2 Litres of water per person as there is no shop or a water source enroute. Hiking pole to get a grip over few slippery patches of grass. We simply don't want to see you rolling down few hundred meters. Never Go Alone. Always take a guide because we have been hearing Jungle Book stories on this route when people venture alone especially in late evening. Though every Jungle book character would try his best to maintain a great distance with humans even if he is hungry, Provided humans do their best to keep them away. (Loud music/frequent whistles work good. 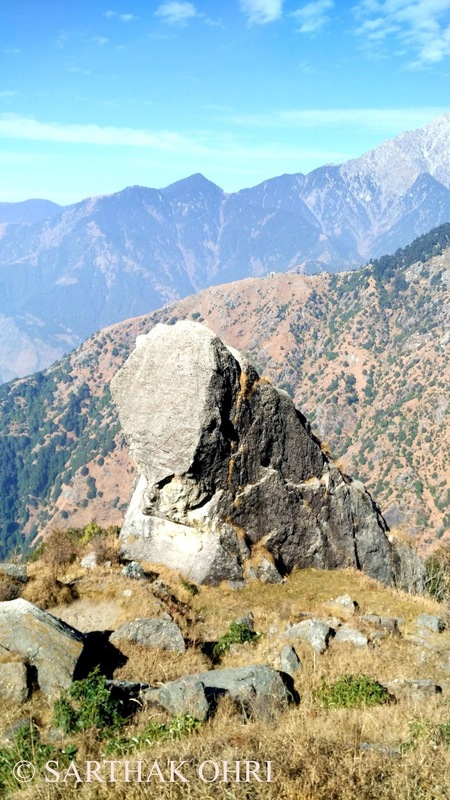 If you don't know how to use these, you should definitely spend a night at Triund). 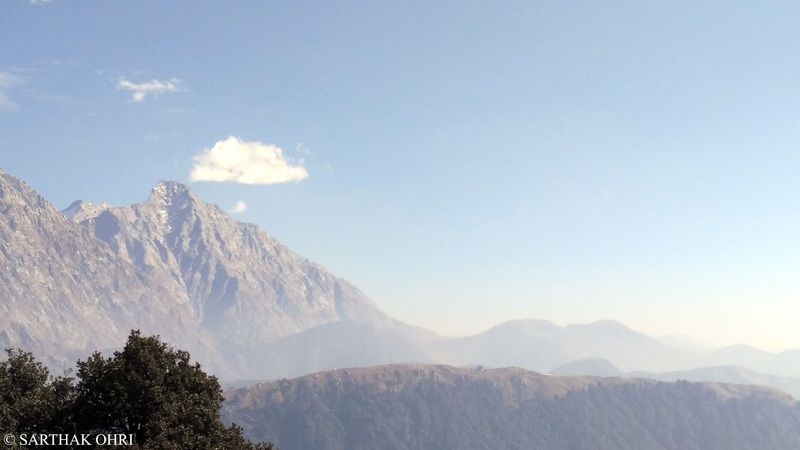 The route is all about gaining altitude and is a moderate one. It is always better to plan a turnaround time on new routes where you have NIL chances of finding any support. Education should be aimed at moulding students on the lines of human values such as love, peace, righteousness and non-violence. Our schools built under the ideals of Swami educates children for academic perfection as well as human excellence. Swami, in his subtle form, continues to drive his institution on this lines.